Benjamin Cushing was born in 1706 in Scituate, MA, the eighth of eleven children of Hon. Judge John Cushing, Jr. and Deborah Loring. He was a great‑grandson of Matthew Cushing who hailed from Hingham, England, and was one of the original settlers of Hingham, MA in 1638. In 1734, Benjamin married Elizabeth Antram of Providence, and the couple settled there. Elizabeth was the daughter of local merchant and distiller William Antram. 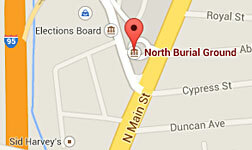 In 1737 Cushing built a house on North Main Street, at the corner of North Court Street, for his growing family. 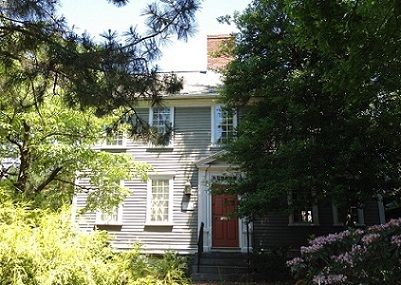 One of the oldest surviving houses in the city of Providence, it was moved to 40 North Court Street in 1875. There it served as the model for Dr. Elihu Whipple’s house in H.P. Lovecraft’s tale, “The Shunned House.” Benjamin and Elizabeth had three children born between 1735 and 1738: Benjamin, Jr., Abigail (who died in infancy), and Ann. After Elizabeth’s death, Benjamin married Abigail Ford Richmond, and she bore him son Nathaniel and daughter Abigail. This Abigail later married the widowed Stephen Harris and lived for many years in “The Shunned House” on Benefit Street. Cushing’s house, now at 40 North Court St., Providence. 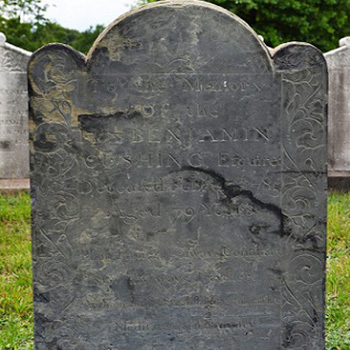 Benjamin and Elizabeth had three children born between 1735 and 1738: Benjamin, Jr., Abigail (who died in infancy), and Ann. By 1741, Benjamin was well­established as a hatter and furrier in Providence; he also co- owned a charter vessel. In 1747 he is listed as a Justice of the Peace. He was known to have traded furs to England in the years prior to the Revolutionary War. He was descended from an ancient and honorable family in the Commonwealth of Massachusetts, and formerly filled a Public Station in this State, to universal Acceptance. He was a gentleman of exalted Piety, a pattern of industry, economy and prudence; a kind husband, a tender and affectionate parent, and a good neighbour. In him were combined the character of the good samaritan, and the amiable Nathanial, in whom was no guile.